I felt this sketchbook and the different styles of art was worth looking at. It's so visually stunning! Plus, the art and writing together so clearly defined the unique presence of Gotham, its characters both good and bad that we've come to know and imagine. It completely captured my mind to realize all the reasons I've loved Batman over the years. And in the end, I feel I don't really want it to end. I would love to see Gaiman and Kubert team up again, oh, pretty please let them have another issue. It truly was fantastic and not to be missed for loyal fans. One for halls of nostalgia and classic comic heroes always. If you're not a Batman fan then you might at least browse through this shadowy work of art in the bookstore. It's glowing! I love a graphically enhanced batman. I'll have to check this one out! Batman's probably my favorite comic-book hero. mostly cuz he has no super powers. no Spidey-sense, no Superman invincibility. etc. just kewl, believable gadgets and his wits. 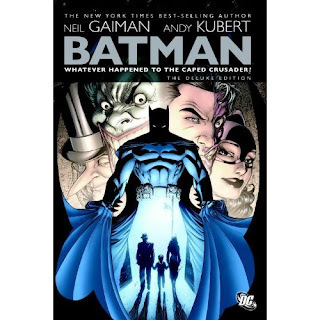 I love Batman and and Gaiman. Thanks for sharing this book. I will have to check this out. Though I will tell people it is for my teen LOL.